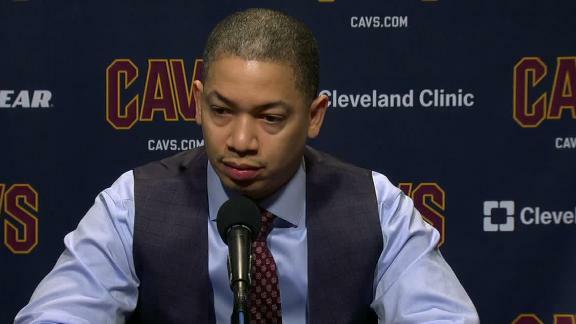 CLEVELAND — Coach Tyronn Lue was succinct and direct in his rebuttal to point guard Isaiah Thomas’ critique that the Cleveland Cavaliers are suffering this season because of their failure to execute in-game adjustments effectively. “That’s not true,” Lue said before Cleveland’s 140-138 overtime win against the? Minnesota Timberwolves on Wednesday. When a reporter repeated that it was Thomas’ words he was quoting, not his own, Lue doubled down. Thomas delivered his critical comments after the Cavaliers blew a 21-point lead Tuesday en route to an 18-point loss to an Orlando Magic team that was tied for the worst record in the Eastern Conference. “Collectively, as a group, we got to do better,” Thomas said Tuesday after a game in which Lue left early in the second quarter because of an illness, handing over coaching duties to associate head coach Larry Drew. “It’s not just about me. We got to do better. We got to adjust throughout the game. They made adjustments and it worked, and we just kept getting hit with the same thing and we made no adjustments. And that’s been one of our biggest problems all year, is adjusting. Lue, back coaching on Wednesday, was asked about Thomas’ integration with the Cavs this season. “Just taking some time to get ourselves jelling as far as offensively,” Lue said, “with IT being out for so long, and then having to come back and, you know, having to play well, the pressure to play well, when he’s really not 100 percent yet as far as getting his legs and conditioning-wise. Thomas has not made ardent strides since coming back from a torn labrum in his right hip that sidelined him for 7? months. He has regressed as of late, averaging 13.8 points on 28.6 percent shooting and 12.5 percent on 3-pointers in his past five games, though he did have 13 points, three rebounds and seven assists Wednesday night. Despite his struggles on the court, Thomas has remained vocal when it comes to pointing out the Cavs’ problems. He acknowledged on Tuesday that his habit of speaking up has caused some backlash. Wednesday was Thomas’ 29th birthday. The Cavs organization posted a tribute photo in honor of their point guard to their official Instagram account, which has approximately 5.9 million followers. The team decided to turn the comments off on the post, however, in an attempt to keep the spirit of the post about positivity and shield Thomas from some of the ire of fans looking to leave negative comments after seeing the Cavs enter Wednesaday having dropped 13 of their past 19 games since Christmas Day. “No haters hours [typically 9 to 5, Monday to Friday] allowed on birthdays at all,” a Cavs spokesman said in quoting an internal memo, which offered a tongue-in-cheek explanation of the decision to turn off the comments on the post. The “hating hours” line has become somewhat of a catchphrase for Thomas, as the two-time All-Star often will reference it on social media and even had it printed on a T-shirt that he wore to the Cavs’ game against the Houston Rockets on Nov. 9. The Cavs also posted the birthday message to their official Twitter account, which has approximately 3.1 million followers. Disabling comments is not allowed on Twitter. Many of the comments were derisive and referenced Thomas’ reported role in the Cavs’ explosive team meeting several weeks ago, when the seven-year veteran called out forward Kevin Love for leaving a game early because of an illness. Wednesday’s overtime victory was likely a welcome birthday present for Thomas.